No a GUI for OniSplit that is focused on level importing. So in the GUI you can select the .dae and /or textures and choose which levelx_Final folder to install and then build that one level. Also for creating pathfinding grids, there will be a way to select the model and the BNV .daes. I was going to update AETools with a levels tab, but realized that PC users can also use such a tool. Interesting. However, I need someone to teach me how the AE Installer does what it does. I've never researched about it. It simply sends command-line, uh, commands to OniSplit like '-import:sep', etc. That's all your app needs to do in order to automate the level making process, well maybe that and a little file management or something. EdT: that OniSplit you gave me kinda converted my level smaller than the others, but for the arc level, something still bugs it. I call this Sketchup level, "The Mess"
Obviously, something went wrong here... The dae file produced by Sketchup is giving OniSplit problems. Hopefully, this can be fixed. ROFL, can you let me give a look at the project file? If we really can't make the .daes produced by SketchUp work, we will have to produce our own .daes, if you know what I mean. But that doesn't make sense, because miniP works well. if u export to xsi and resave the dae from xsi .. doesn't that work ? Oh god! Thanks a lot samer! EdT: Just to make sure, you have to disassociate (or whatever it is called) every component and then group everything. Did you try chaging the measure system or you are using that new OniSplit? Have you tried other OniSplit versions? Can you see your level in XSI, correctly? That is weird... Your level seems to be made basically of rects. Are those things supposed to be on the floor? They seem to be rotated like the arcs used to be in my tutorial level. However, something makes mini-Partenon works, and we have to find out what. Also, does OniSplit say anything about your level? I may be releasing the "source" project of Partenon soon, so we can study it better. It could be how I made the walls. I pulled the side walls from the main wall, perhaps I should have made each wall separately. Also, I gave the inside a different texture, that's the part hanging down from the building. I will try a different method next time. - Mini-Partenon works perfectly exporting from SU, even if I'm using kinda complex shapes. It seems that SU isn't perfect when it comes to exporting as .dae, but it is also weird that you can't make your level work using the XSI method. Samer: Ah, well, that level is quite incomplete, and it is only a level as tutorial, so I think I'm not actually releasing it as a stand-alone new level. After lots of trial and error, got this far. 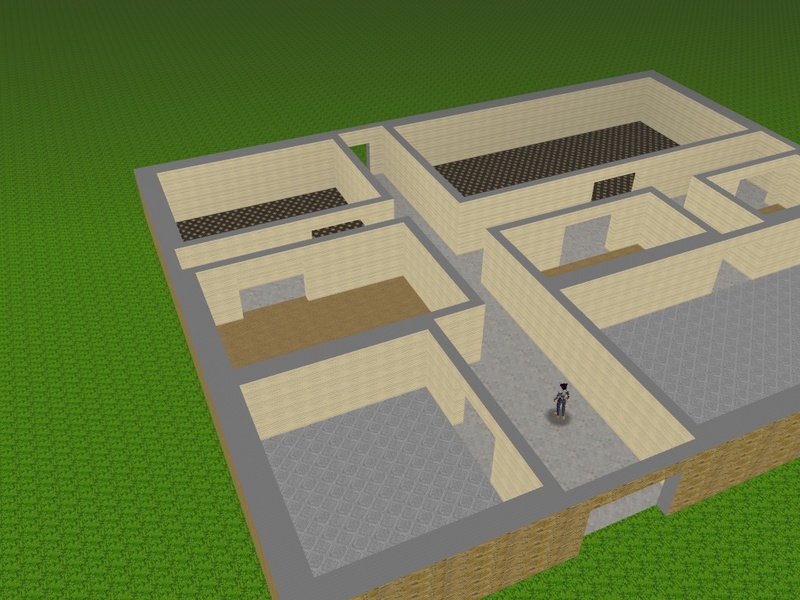 I used the method from the video "Google Sketchup Floorplan Tutorial ", though I wasn't very accurate at first. Walls are different thickness, then the building was too small for Konoko, so I scaled the building, that's why the doorways are very wide. Next time, either I well use a real floor plan or use the girl model as reference. The building is a single object and the walls pulled up from the original rectangle. I used various textures for the floor, and walls. The large green area is a separate ground plane. 2) Test frequently by importing into game. 3) Save differently named versions (building1, building2, etc) as you progress. So if you mess up, you can back to a version that worked before. 5) File > Export > 3D Model, under Options select "Triangulate All Faces"
6) When converting the textures to .oni files, make sure the original image is the correct size: 128, 256, 512, odd sizes produces odd looking textures. P.S. I have no idea what caused the problems with "The Mess"
Ah, thanks for this tutorial, EdT! Yes, texture sizes should be powers of 2. BTW, am I allowed to give people, along with my level tool, that OniSplit you gave me wich is better for importing levels? 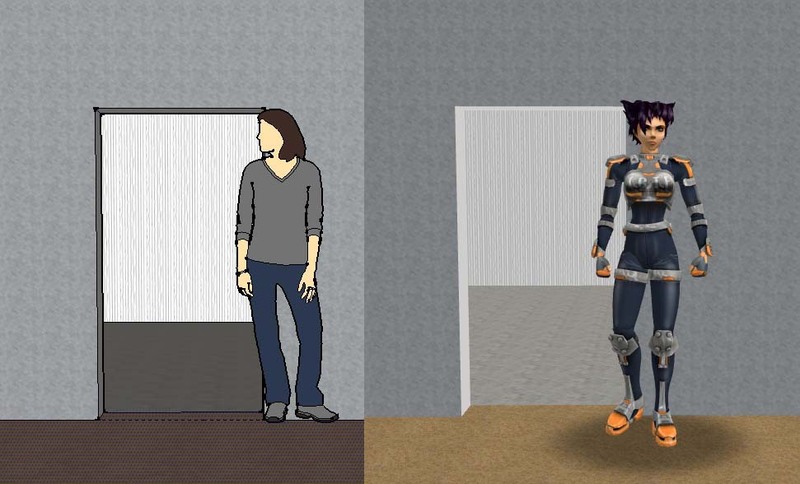 The girl model in Sketchup is 5 feet 6 1/2 inches and the door frame's height is at 5 feet 7 inches. So that means Konoko is about 5' 6" in height, not including the top of her hair! That means when designing in Sketchup, if you use real world dimensions of objects, buildings, vehicles, furniture, etc, it will be the correct scale in Oni. Lukas, you can release the latest version of OniSplit with your tool. EdT: that is, if you don't change the measure system to decimeter, right? 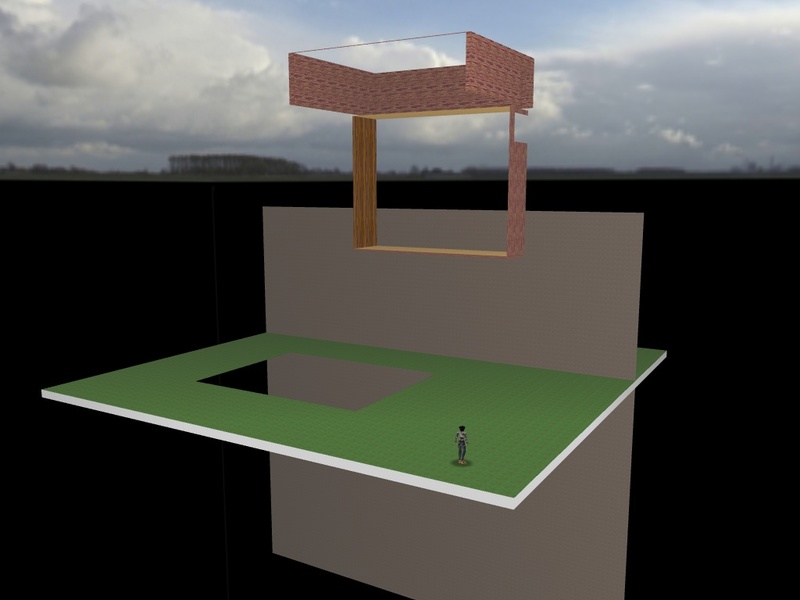 Being able to use the default measure system of SketchUp will be of great help. Lukas: The clue to solving this issue with the rotated arches, is... what makes the arches different from the pillars, ground and roof? What keeps the arches connected even though they as a group are rotated 90 degrees? Have you tried making and importing other levels? I'm struggling to make a level model, trying to get used to how Sketchup handles different things. The arcs should be connected to the floor too, and the roof. 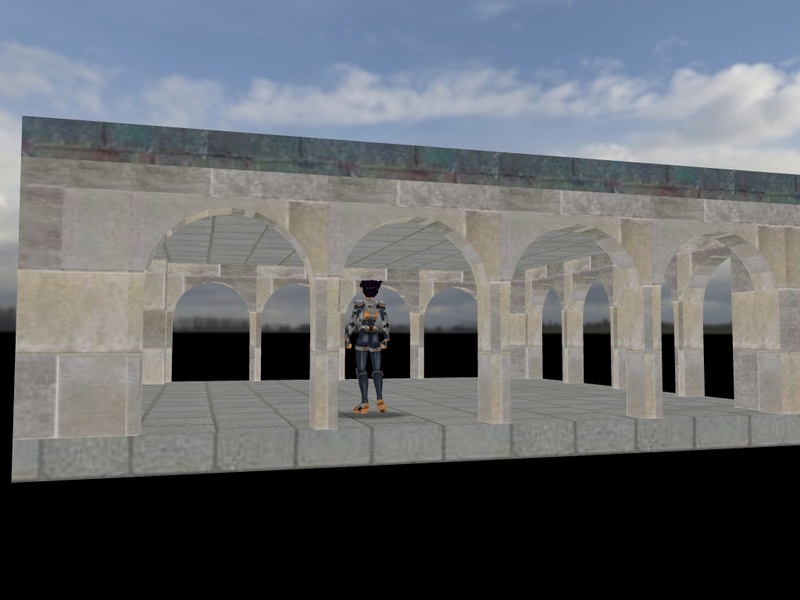 By the way, the roof was made using as base the edges of the pillars, but that was while they where still one component... Actually, the arcs were connected to the floor while they were still a component... But the pillars in miniP were components too in the start. Not ever making the arcs components could help, but I doubt it is the main problem. The arcs were initially a wall, as you know, so it seems that one of the steps in the tutorial "corrupted" it. I doubt that common walls would be any problem. Actually, my test level "pillars" is completely made of simple cubes, not connected and never made components. So maybe it is the curves in the arc, the ones used to make the hole... I might later try making those arcs another way. Sorry for taking so much time to release the level tools, but I'm currently fixing a lot of problems I had with my computer, and soon, after I'm finished clearing up the mess here, I'll be releasing it.